Hidden Dragon is an interesting 2.5D platformer and brawler from Oasis Games. Join The Gamers Lounge as we fight through each level, examining what makes this game intriguing and what improvements could be made. Hidden Dragon throws players right into the action without any explanation. The protagonist wakes up with no knowledge of who they are or what they did. There is nothing but carnage all around, dead bodies are everywhere. Gamers quickly learn the protagonist is named Lu and he must stop the shadowy group known as the Organization This could be the bad plot of an old kung fu movie, a bad NES game, or the questionable plot of Hidden Dragon. Gamers will quickly find out the writing is a bit off, and the story is muddy. Maybe this was intentional, to keep things interesting? The voice acting is not much better and feels flat, but again, this might be part of the “B” movie charm. There cannot be bad elements without a few good ideas. Hidden Dragon does have some fun options for combat. This might be the only saving grace of this game. 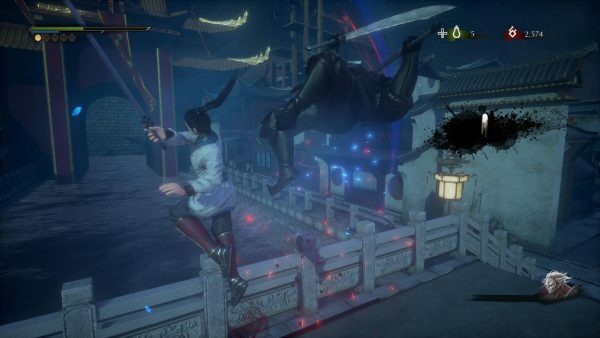 Hidden Dragon’s combat system revolves around heavy and light combos. These are easy to execute and provide punishing results. Lu has a few more combat options at his disposal. Players can dodge attacks and unleash super moves once a meter is full. The game also features some light RPG elements as gamers will invest points in new skills. The enemies are not challenging but they are repetitive and most of them have more health than they need. Gamers are going to have to pound away until the enemies drop. This same strategy applies to bosses. But this, along with the repetitive and mediocre combo system, can become a chore. I started to lose interest. The platforming elements could have saved a game like this, but instead they only made it worse. When Lu jumps he feels very stiff and he cannot grab onto ledges. While ledge grabbing is not an essential feature, it could have added a lot to Hidden Dragon. There are a few more problems with Hidden Dragon. The audio is bland and the music isn’t anything to write home about. The graphics are dull and the backgrounds all start to blur together level to level. I could have forgiven the bad voice acting and repetitive combat if the game looked nice and the music was memorable. While I wanted to like Hidden Dragon the game lacked the finesse or polish found in other similar games. Some examples of similar games include Mark of the Ninja, Shank, Streets of Rage 2 or even Final Fight 3. The gameplay could have saved the game but even after a few hours that gets dull.